We believe in a fun, playful, and educational environment for our young visitors. Make sure you check out our large selection of children's, juvenile's and young adult's books both in fiction and non-fiction. And after you've picked out your books why not stay and play! We have puzzles, toys, puppets, coloring sheets with crayons and a Velcro storyboard set up for kids' imaginations to run wild! This event is open to all school-age youth with a basic knowledge of chess. Beginners are always welcome. An adult mentor is available to provide some help. Call the library (336-2667) for details or to sign up. Walk-ins are always welcome. Families are invited to join the 1000 Books Before Kindergarten program. This is a nationwide challenge to encourage parents and caregivers to read aloud to their children. By reading just 1 book a night, families can reach the 1000 book goal in three years. It's fun, promotes a lifelong love of books and reading, and provides children early literacy skills and a good vocabulary. Research shows that the most reliable indicator of school success is being read to during early childhood. Check with Miss Krista to register your child in this important program. Starfall is a free public service to teach children to read with phonics. Our systematic phonics approach, in conjunction with phonemic awareness practice, is perfect for preschool, kindergarten, first grade, second grade, special education, homeschool, and English language development (ELD, ELL, ESL). Starfall is an educational alternative to other entertainment choices for children. MightyBook is the perfect place for children who enjoy books, music, art and games. You’ll find hundreds of original stories, songs, games and puzzles, plus scores of classic books, poems and songs. Everything is illustrated, animated and read out loud. 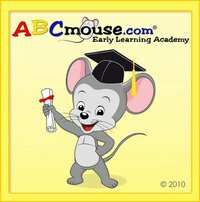 ABCmouse is a comprehensive early learning curriculum (Pre-K to early primary) with more than 3500 activities and 450 lessons. Children can use this program on the "Kids' computer" in the children's area. They'll love it and learn! Also now available at home by clicking the picture or ABCmouse.com. Checkout the great math site we found with daily story problems to read and solve together. Click the link above.